ADK have tackled Neumann’s M49 before — but in this Custom Shop model, they’ve really pushed the boat out. Is it worth the extra cost? Allen & Heath’s Qu series goes from strength to strength, with the latest offering more I/O, more faders and more mix groups. I do like a gadget, and at a show in Rome last week something shiny caught my eye. Arturia have pointed their considerable modelling experience at recreating a ‘60s classic. There are many companies making interfaces for Pro Tools HDX systems these days — but straying from the Avid path carries some risks. Drum Spillage 2 lets you get down and dirty with synthesized drum sounds. When a top hardware expert turns his attention to plug-in design, the results are a bit special. Is EHX’s latest pedal perfect for guitarists who want to pull out all the stops? If you use outboard gear with your DAW, this could be just what the doctor ordered. Headway’s portable preamps are designed to help you get the best possible sound from your acoustic instrument, whatever it may be. How Effective Are Portable Vocal Booths? Portable acoustic screens are designed to make it possible to record good–sounding vocals almost anywhere. We put this claim to the test! 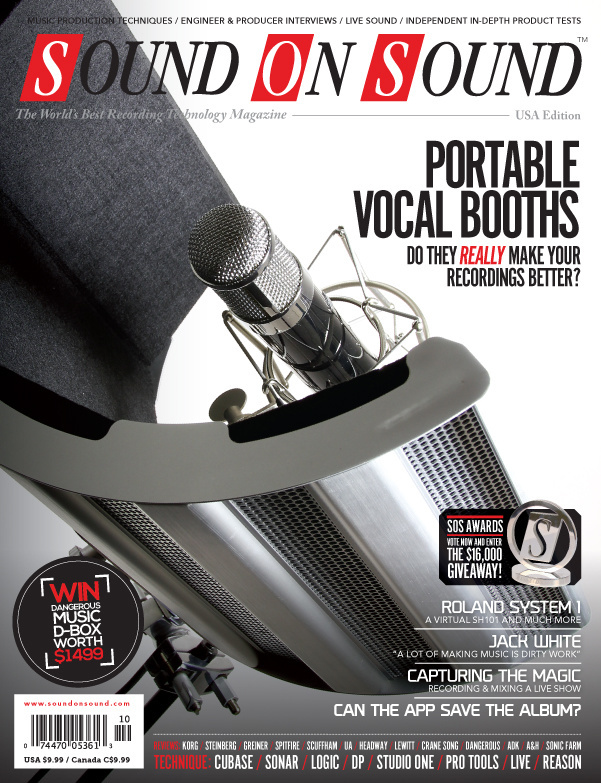 Read more about How Effective Are Portable Vocal Booths? A modern stompbox take on a classic digital delay unit — what’s not to like? Lewitt have made some fine impressions in the studio world with their innovative mic designs. Can they do the same for the stage? An oft–overlooked advantage of analogue working methods is sensible metering. MeterPlugs’ K–Meter brings the same approach to your DAW. The Nicerizer Junior aims to offer what analogue still does best — subtle, yet pleasing warmth and distortion. The System 1 is a fully fledged synthesizer in its own right, but it can also assume the identity of Roland classics using its built–in ‘plug–out’ technology. Two contrasting new virtual amplifiers and a reverb add to the appeal of Scuffham Amps’ virtual amp simulator. This 500–series preamp boasts huge tonal versatility. Could Steinberg’s mid–sized USB audio interface provide the perfect package for the home studio and music on the move? Two reviews for the price of one here; Ueberschall’s Brasil Nova Primeiro and Brasil Nova Segundo. Universal Audio’s catalogue of virtual vintage plug–ins continues to grow. For Jack White, analogue recording is not about looking back to the past, but choosing the ideal medium for his art. This page contains a directory of all media pages that hold the associated media for October 2014. Patrizio Cavaliere: Our engineer sorts out the bottom end of a deep–house track. The plug-ins that come with Pro Tools are more powerful than you might think. Get the visual feedback you need with custom metering in Sonar. We delve into the mysteries of envelope following in Ableton Live. Recording on location presents many challenges: this book will help you meet them. We overcome unfriendly acoustics and troublesome spill to capture a memorable gig. Enjoy the creative possibilities of taking Digital Performer’s bundled plug–ins out of their comfort zone. The SOS team visit a community youth centre to help them make the most of their new studio setup. Nine more ways to kick off your productions in Logic Pro X. We look at what’s new in the eighth instalment of Reason. This month brush up on your listening skills with Kiesza, Rita Ora, Duke Dumont, Kaiser Chefs and Mr Probz. Plus our Classic Mix - Santana's Smooth featuring Rob Thomas. Studio One lets you apply effects directly to audio Events, opening up innumerable creative possibilities. The ZIP file of the Cubase 7.5 project template. This month we review releases from Dreamlake, Jimmy Brewer and Phillip Sandifer. Why music is better now than it ever has been. Alex Marten asks the question. Can The App Save The Album? Smartphones and tablets are giving artists new ways to explore multimedia. Does the ‘album app’ have what it takes to rekindle music sales? Read more about Can The App Save The Album? Credits can be a vital resource to the media composer, but they can also be a ball and chain. Historic studios might hold emotional value for us, but they are, after all, still only buildings. Only a very few studios in the world are capable of accommodating the largest recording gigs. Media content for the October 2014 issue.